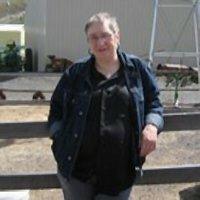 I first learned about Margaret Mills from an article that she wrote for I Heart Art: Portland titled “The Healing Arts and Crafts,” in which she described how crochet had helped her to acknowledge and then heal from depression. I later interviewed her about how crochet helped her to heal and shared some of her story in my book, Crochet Saved My Life. I recently reached out for a new interview, in which she shares more of her powerful story and the ways that crochet has been a creative asset in her life. Q: What can you share about your experience with breast cancer? A: I was diagnosed in 2008 and had a double mastectomy followed by several rounds of chemotherapy. The type of cancer that I had was fairly common and one of the more treatable types, which was something of a comfort. I continue to take one of the varieties of hormone-suppressing medications to reduce the risk of recurrence and still have checkups annually. I was at an early stage, but I had two different types of cancer in two breasts. I often feel I got off light compared to what some have gone through, both in the severity of the disease and the treatment, but it is definitely a life changing experience. Q: What were the most important things you had or did that helped you get through the diagnosis, treatment and recovery? A: The support of family, church and even total strangers was enormously helpful. The comfort of faith in God. My children. People who brought in meals. Those things are huge. One thing I did that helped both physically and to feel more in control was to have the help of a naturopath. I believe her supplements and diet and exercise suggestions helped me deal with the chemo better than I might have. Q: How did crochet play a part in your recovery? A: I wasn’t crocheting at the time of my diagnosis. However, while I was undergoing chemo I began to notice things. I noticed that sometimes people brought crochet or knitting to work on in the chemo room while they were hooked up to their IV’s. Also, I noticed that there was a bookcase nearby where they kept free hats (chemo caps) and scarves for the hair loss. I realized that they were all handmade – some crocheted or knitted, some sewn. Also, a group of women that I didn’t even know (from a church in another state) made me a prayer quilt, and a close friend made me crocheted lap afghans. This all focused my attention on how we use creative crafts both to lift our own spirits, and also to reach out to nurture and comfort others. I think that helped me decide to begin crocheting again to deal with the depression that came on around this time. Seeing those things, people responding in that way with crafts, planted that seed. Just after I finished chemo, my mother became ill and came to live with us. My daughter was going through some stuff (later diagnosed with an anxiety disorder) and it was all a bit overwhelming! That’s when I took the hint and began crocheting again. Having a project to keep me occupied while sitting with Mom in the evenings, planning and completing a creative project in spite of the fog of “chemo-brain” and the simple, repetitive work all helped with the depression. Q: How has crochet / crafting been a part of your ongoing wellness plan since that time? A: For me crochet has really come into its own as a benefit over the long haul. With more women surviving breast cancer, and living longer lives, there is a whole area of life afterwards that needs to be addressed. I’ve seen it called “the new normal.” We ourselves, as well as family and friends, tend to believe (logically) that we recover and get on with it, but it isn’t that straightforward. One area, as we’ve already discussed, was dealing with depression. That was helped by just having a project, a goal, that was creative and fun and not too hard. I think doing something for others really helped counter a tendency toward self-absorption. When you are in a serious battle with a disease like that everything become about that if you’re not careful. I started crocheting and making gifts for my grandchildren. Eventually I looked into some of the charity organizations and found there are so many ways to use crafts to help others! You can make afghans, hats and mittens for the homeless, foster kids, abused women. There is a need for tiny caps for preemie babies, and helmet liners for soldiers. Not to mention the chemo caps. I contacted the place where I had been treated (to see if I could donate), but they had a surplus, which I found gratifying. People are aware. Reaching out like that, even with a little preemie cap, helps you feel like you still have something to contribute. And that is SO important for your long-term mental and physical health. There is another way that crochet has been valuable that is a bit more personal. With breast cancer, of course, women really take a hit in the self-esteem and appearance department. Not everyone has a double mastectomy as I did, but there are adjustments to be made to shape changes, scars and so forth. In my case I chose to not have reconstruction, so one deals with prosthetics and clothes not fitting like they used to. Also, an unusual thing that happened to me with chemo is that my hair grew back, but much thinner than it had been. I read on a forum about halfway through treatment that the type of chemo I was taking sometimes caused permanent hair loss. Not good news! I had thin hair anyway due to an underlying autoimmune disorder, but before chemo I could wear it in a regular style, perm it, whatever. It did grow back, but so thin I’ve had to keep it ultra short. Finally, the medication to suppress hormones ages you, can cause osteoporosis, throws younger women into menopause, etc. Coupled with the fact that the health crisis is over and you lose all that concern and sympathy, it can be a dark place. Welcome to the New Normal. There you are: no cancer, but semi-bald with two pounds of rubber strapped to your chest. Maybe you have compression sleeves for lymphodema (something I’ve dodged, thankfully), and are catapulted into old age with aching joints and wrinkled skin. Now what? For a long time – too long, really – my uniform was black or gray hoodies and blue jeans. Doing my hair, dressing up, putting on makeup seemed like a bad joke. Once I started to crochet things for my grandkids, however, I began making hats for myself. That was where I began to pull out of the hoodie thing (I still have days). I have a stocking cap pattern I can do practically in my sleep, so I made myself several of those. I also have tried the newsboy cap in crochet, but not successfully yet. 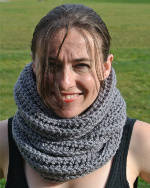 What was really fun were snoods; check them out if you haven’t yet! It was natural to branch out from there, add a scarf in a matching color, then try a vest or a shrug or a poncho. I’ve never seen myself as the chic ultra-short-haired type, but crochet helped me to explore and test new looks, play around a bit. There is something about making an item yourself, slowly, stitch-by-stitch, that seems non-threatening and healing. For me there never seemed enough time to process, to grieve. Diagnosis, treatment, recovery … bam, bam, bam. Even when I went to the mastectomy shop to get prosthetics and bras the first time it seemed too soon – too much lace and silk and soft music when the scars were still fresh and my feelings called more for sackcloth and ashes, wailing. Crocheting hats, gloves, scarves, vests for myself has slowed things down and helped me come to terms with this new look (in an ongoing process). Q: You said in another interview: “Crocheting taps into an unrealized artistic vein. Creative ideas start with a new yarn project, then spill over into house decorating, gardening and even my writing.” This seems to relate to what you’ve just said about how crocheting can help rebuild self-esteem in many ways. Can you share more about that creative process? Q: I so agree! On a lighter note, do you have a favorite crochet project you’ve made? A: Making the big ripple pattern afghan over the winter was fun and I’m glad I got it done. I made my first ripple afghan when I was a teenager. This time I had bought some yarn for another project. When I thought I wouldn’t have enough I ordered some online and they turned out to be double skeins. So I had lots! 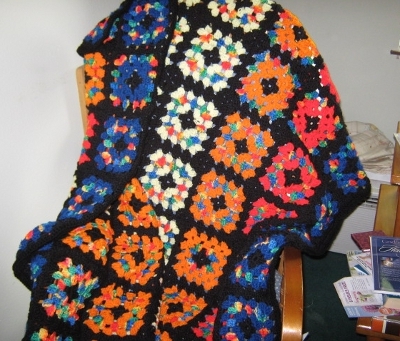 I wound up unraveling the original project and making the afghan. It’s simple, but it fits a decor scheme I have going for the family room. I am also really fond of the amigurumi creatures. Someone gave me a book of amigurumi patterns that is a bit challenging, so I am looking forward to getting into that. And there are other projects I have planned. One of my favorite things is a vintage pattern from England for a compact net shopping bag. I made one and keep it in my purse and plan to work on more of them. Q: How have you seen crochet cross the generations in your family? A: With my grandmother, and to a certain extent my mother, crochet, quilting, sewing were necessities. They either made things themselves or did without. With myself and my daughters, it is more of a hobby, something that is important to us, but nothing that is a practical necessity. You can buy throws and pillows, scarves and hats anywhere, often for less cost than you can make them. So that is a change. Otherwise, I think the interest and excitement about a project is the same. We all still collect patterns and magazines and enjoy walking through yarn stores – all four generations of us! Q: What comes to mind when you try to imagine a life without crochet? A: I’d probably take up knitting!! (LOL) No, losing crochet would be bleak. I can’t really imagine that, but I think we will always find creative outlets, somehow. If it isn’t yarn-work, it’s sewing or cooking or woodwork or basket weaving – we need to be creative to thrive. I do think it is important to fight for it, though. I remember as a child Mom telling me my grandmother (her mother-in-law) couldn’t do her fine needlework anymore because of failing eyesight. That must have been such a loss for her. I recently bought my Mom a huge standing magnifying glass when she said she couldn’t see well enough to work on her quilting. She doesn’t use it much, but still…we make the effort. It matters. Q: Yes, it does matter. To wrap up I wanted to touch on something that you brought up at the beginning of this interview, which is that there are a lot of different ways that people can donate their crochet, including to cancer-related organizations. Can you share some more about the impact that can have? A: I was touched that people would do that, and I know I’ve kept the prayer quilt those ladies made me. I did take a cloth chemo hat from the treatment place and wore it during the worst of the hair-loss, so I do think it helps a bit in practical ways. It’s more the thought, thought, the fact that someone cared enough to do that, that is really making a difference. The chemo room is bleak enough, so having that shelf of handmade freebies is a nice touch. Everything helps. Margaret Mills is currently working on sharing the story of Oliver Cameron, an Alaskan pioneer who pursued a handcrafted way of life. Kathryn Vercillo is the author of Crochet Saved My Life. Kathryn blogs about crochet art, fashion, designers, books and more at Crochet Concupiscence. Great job, Kathryn. Thank you for sharing my story. Coincidentally, I read it after just getting home from one of two annual check ups I have. All is fine, and heading into year seven now. This is a very thoughtful and articulate article that touches on the most personal aspects of breast cancer treatment. Margaret says may things that are very true about the after-effects and the help that crochet brings. I will share it with the support groups I know. Thanks.